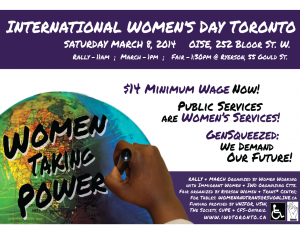 Please join us in celebrating International Women’s Day in Toronto on Saturday March 8th, 2014. We want to build an even larger turn-out than usual marching through the streets, raising our voices, and calling for the kind of city and society we want. This is an important year to show the strength of the women’s movement. We are having an October municipal election and most likely a provincial election will be soon. Let them know our strength! Invite your family, friends and co-workers. Please email to your networks. All are welcome. Click here to download a copy of the IWD 2014 Toronto poster.